Shopping and blogging are two of my favorite hobbies! But I haven’t had time for either lately. My first priority right now is taking care of my sick mother, and rightly so. But today I decided to steal an hour for myself and take a trip to the mall. With limited time, I decided to concentrate on one desired item: a coat. 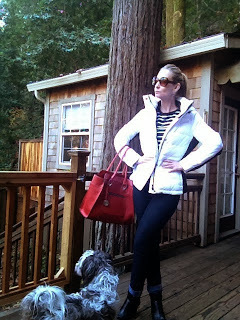 I had asked my husband for a warm coat for Xmas and I got this totally fabulous Calvin Klein puffer ski jacket that I LOVE! 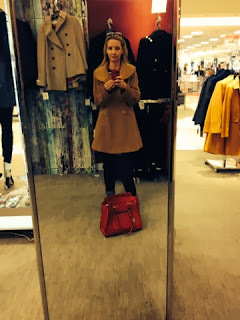 But I still felt I had room in my wardrobe for a wool coat, something warm, classic, and versatile. I saw that Macy’s was having a sale on their coats, 50% off most of them, so that’s where I headed. First I tried on this cute plum Calvin Klein, but wasn’t sure if plum was neutral enough. This Jason Kole was a steal and cute, but just not quite long enough for my 5’7″ long-waisted frame. 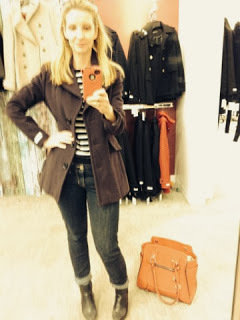 I tried on this London Fog coat and liked it a lot. Red is my favorite color and it even came with it’s own plaid scarf. Almost love, but not quite. This was their smallest size and it still seemed big on me. Next, I tried on this adorable BCBG plaid jacket, but again I was looking for something more versatile. 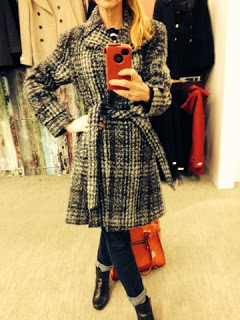 How lovely is this DKNY tweed coat? But the plaid had hints of plum in it and I just didn’t think it would go with enough of my wardrobe. I love camel, but this pretty Larry Levine just looked shapeless on me. 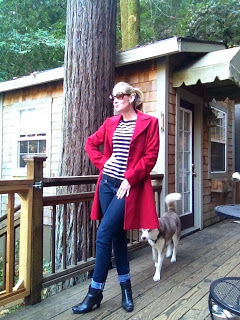 Then I found this Larry Levine classic walker coat in my favorite color. Originally $275, it was %50 off + an extra 15% off today. Hey, red is a neutral to me! I loved it even more when I got it home …. Thanks for taking my quick shopping trip with me, Dolls! 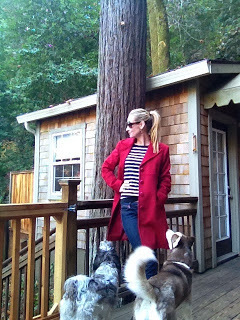 Keep an eye out for more looks starring my new coat on Instagram @fashionshouldbefun ! What a great idea for a post!! 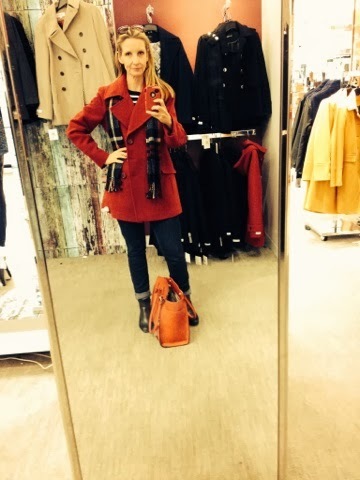 I'm always up for a shopping trip…even if it's a vicarious one!! 😉 The colour and shape of your final selection look lovely on you…definitely a winner!! 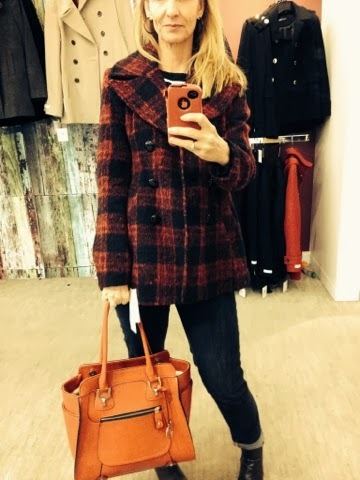 How I love this coat! You picked the right one for sure. So sorry about your Mom. I hope she is feeling better soon. Thanks so much for stopping by my blog, Suzanne! Love your Style Files! Thanks, Nina! I'm following your blog now and am really enjoying it! If I had treats in my pocket, those critics would approve of anything! 😉 Thanks for stopping by my blog. I'm following yours now & it's great! 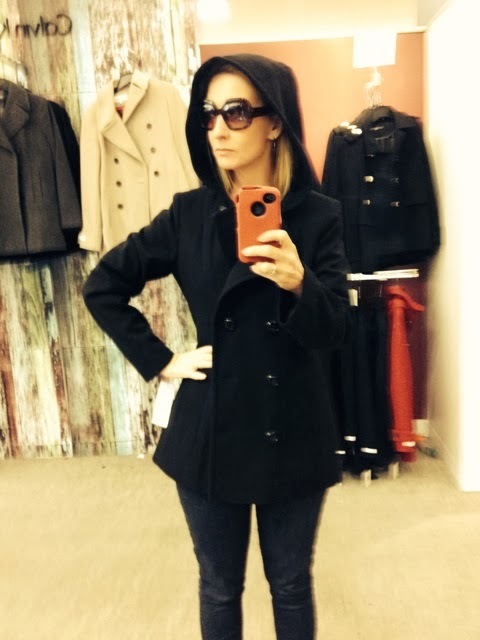 I absolutely adore the coat you chose – the color, the style, the fit, all perfection!